Newly built mid century ranch has 2 bedrooms/2 bathrooms with a king sized hide-a-bed in the large living area. Sleeps 6. Home is 4 blocks from Newport Market and a 10-15 minute walk into downtown Bend. Just walk a couple of blocks down the hill and you'll be on Newport Ave, where you can enjoy many of Bend's west side favorite restaurants and coffee shops. This architectural home features an open floor plan with high ceilings, towering windows and quality finishes throughout. Living area has American Leather (highest quality) king size sleeper and cozy chairs which surround the gas fireplace and huge 60" HD TV for relaxing in the evening after a day on the trails. Gourmet kitchen has everything you need for dining in. All brand new stainless steel appliances, great cookware, Vita-mix for your morning smoothie and more.. Dining room has seating for 6. Sliding doors which go out onto covered patio for kicking back after dinner and relaxing on the back patio...Back patio has lounge chairs for 6 and a commercial grade gas barbecue. Quality furnishings make your stay in the Portland house as comfortable as possible. Huge master bedroom has brand new king sized bed, high thread count bedding, walk in closet and sitting area. Off the master bedroom is a large master bath. The second bedroom has vaulted ceilings, large closet and new queen sized bed with high thread count bedding. 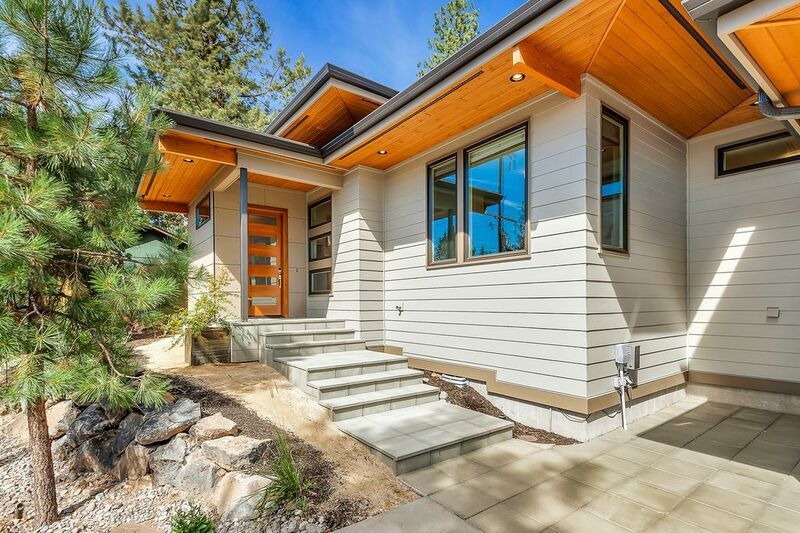 This is a brand new home, located on Bend's west side and close to everything. You can truly park the car and walk everywhere. Phil's trailhead is about a 15 minute warm up ride. We moved from Anchorage, Alaska after 26 years and craved the outdoor experiences we were used to finding in the last frontier. Bend had it all-road cycling, mountain biking, Nordic skiing, back-country skiing, hiking, not to mention a scenic setting! Now relocated in Bend, we spend most of our time on the trails and enjoying our Oregon roots. Off street parking in driveway (no access to garage) for 2 cars. Lovely living area with ample seating for 6-8 comfortably. Brand new QUIET stainless steel Kitchen aid dishwasher. New Stainless steel refrigerator with ice maker and cold water dispenser. 5 burner gas cooktop and electric oven. High BTU burners. Vita Mix, rice steamer, serving pieces. Dishes and utensils for 8. Gourmet kitchen with all brand new appliances, high end sinks/faucets and all the cooking supplies you need for preparing meals at home. Living area has wall mounted 60" HD TV. Bend Broadband "essentials" cable package. Smart TV allows you to log in and play off of Spotify or Pandora. Deck seating for 6; area is covered and lighted. This is a superb home- every detail, large and small, is perfect. It is well appointed, and provisioned, elegant, comfortable, the spaces perfectly proportioned for dinner parties and visiting and it has great interior and outside spaces. It’s in our favorite part of Bend and accessible to everything.The upside is huge and there are no downsides. And communication with the hostess was seamless. A real gem. Great house! Fantastic location to town! This property is simply gorgeous! All of the kitchen amenities you could ever imagine, beautifully constructed and decorated, close walk to market and shops! Great stay in Bend. House was clean and nicely updated. The info book helped for enjoying Bend. This home is so well stocked and very comfortable. It's also within walking distance to some of our favorite restaurants! Excellent in every way. Prompt communication, convenient location, well-kept and well-stocked. We felt very much at home here! Bend is such an incredible place to enjoy the outdoors. The summer heat is not too intense and it cools down at night-perfect for an active lifestyle. Close by, there's rock climbing at Smith Rocks State park, mountain bike trails galore, miles of bike lanes for road enthusiasts, hiking in the Cascades and wonderful restaurants, pubs and coffee shops to keep you fueled for your daily activities. This rental is for the 1600 s/f main house; space does not include access to garage or separate ADU over the garage.